IT in Training or IT Training? Yes. Less than a decade ago, there was a spirited debate in radiology: Did it make more sense to create a PACS administrator by moving someone out of the imaging department and training them in IT or taking an IT staff member and teaching him what he needs to know about radiology? For the most part, the latter option has won out. Enterprise IT folks tend to run the show in the imaging department—and that makes sense to me. If you believe the common industry criticism—and generally I do—that healthcare IT is about a decade behind IT in other fields, then it is perfectly logical to think the IT wizards are more likely to drive the catching-up process than cross-trained imaging department folks. How does that apply to radiologists? David Yeager looks at that in this month’s Imaging Informatics column. He writes about how IT can be used to teach radiology residents, but that IT also should be taught to radiologists. That sounds right too. For certain, there are matters of the level and scope of this training, but I can honestly say that most of the radiologists whom I have met and/or heard speak that seem to understand where the field is going have a pretty strong understanding of how IT is thoroughly intertwined with the future of diagnostic imaging. 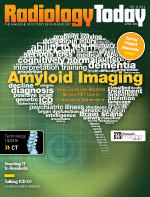 Also in this issue, Beth W. Orenstein writes about new guidelines for using Amyvid (florbetapir F-18 injection), which is indicated “for brain imaging of beta-amyloid plaques in patients with cognitive impairment who are being evaluated for Alzheimer’s disease and other causes of cognitive decline,” according to its prescribing instructions. Exactly what does that mean? Orenstein’s article on page 14 discusses the new guidelines, which were created by SNMMI and the Alzheimer’s Association. Finally, the American Board of Internal Medicine (ABIM) Foundation recently published its second list of tests and procedures—from 17 specialty societies—that it believes patients and physicians should question. Not surprisingly, many of the tests and procedures in this installment of the Choosing Wisely campaign are related to imaging. The article on page 22 lists all the imaging-related tests and procedures as well as the societies’ evidence-based rationale for including them on their respective lists. I’ve no idea how making this list will affect the utilization of these tests, but defensive medicine seems to play a role in including these procedures on the list. Perhaps one conversation these lists will generate is a discussion about a liability safe harbor for not performing procedures that the best available evidence suggests do not help the patient or the physician. That would be nice.